I was hoping to showcase my final bathroom reveal today but unfortunately it’s not fully finished yet. However, don’t you worry, we’re ALMOST done… just a few finishing touches here and there and I will have a finished masterpiece in no time! (gulp). You can check out the progress on my Facebook page or Instagram account. In the meantime, I have pulled some of my favourite and unique bathroom inspirations for all the diyers out there! 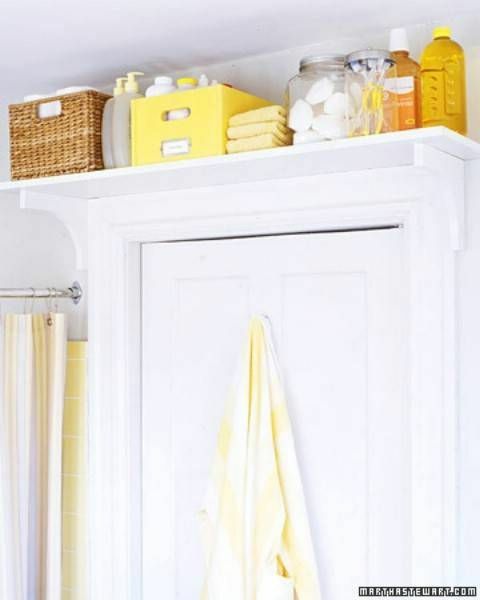 From clever storage, to diy vanities, to inexpensive stenciling—there’s a little bit of everything. Check it out! Need more storage? Install a shelving unit over the door. 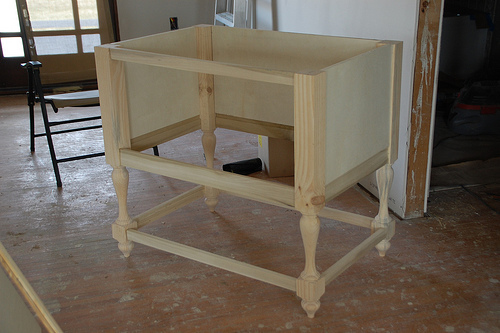 This is the perfect way to store or display those rarely used items. 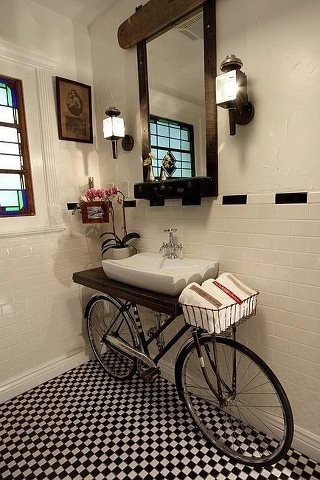 What a great idea for a kids bathroom. 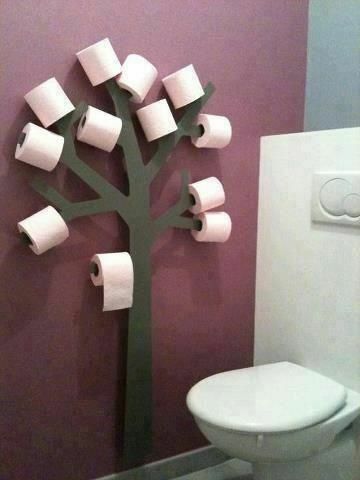 You never have to worry about replacing the roll. Let you kids have all the fun! 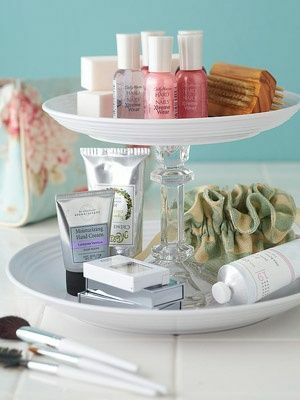 Vintage plates and cheap candlesticks turned into a magnificent display for your bathroom products or makeup. Very chic! 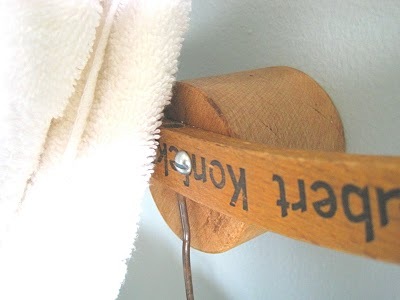 Vintage hangers turned upside down into a hook. Very clever and practical. 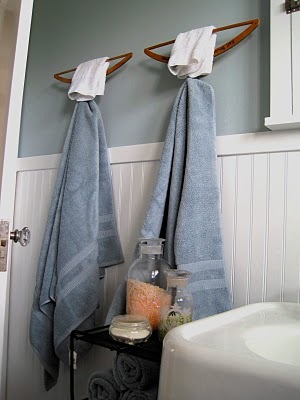 An inexpensive way to showcase your towels. 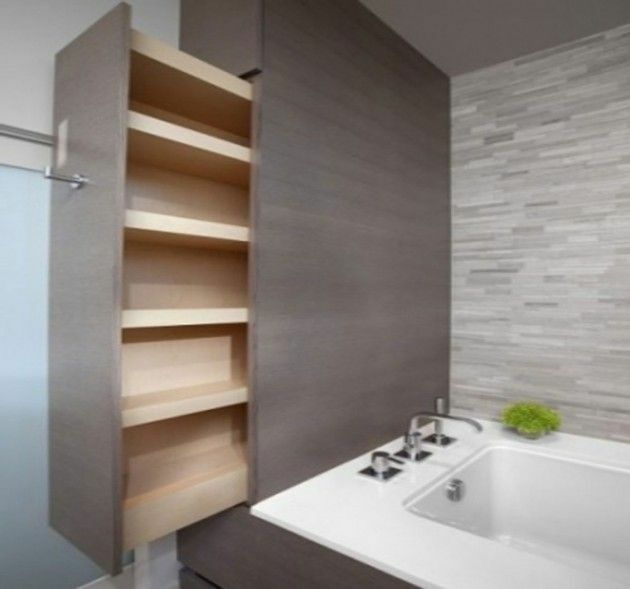 Hidden storage beside the bathtub…I’m in love! 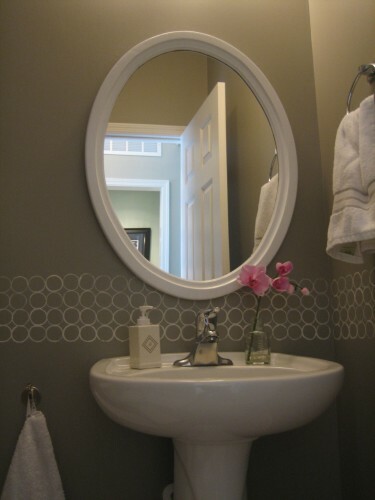 Utilizing all your space is great for those bathrooms that don’t have the space for big vanities or linen closets. What a work of art! This statement piece will have your guests talking for ages! Create a stencil using a toilet paper roll. 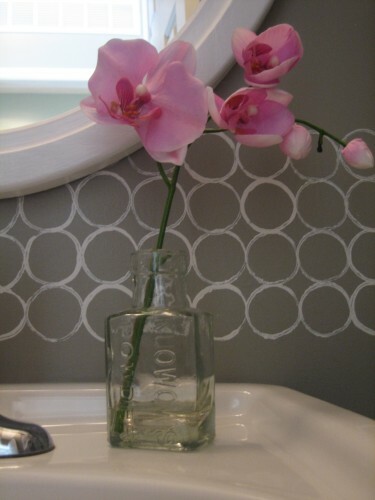 What a fun and inexpensive way to add some contrast to your space! This is a brilliant idea which may have you looking at tree branches in a new way. 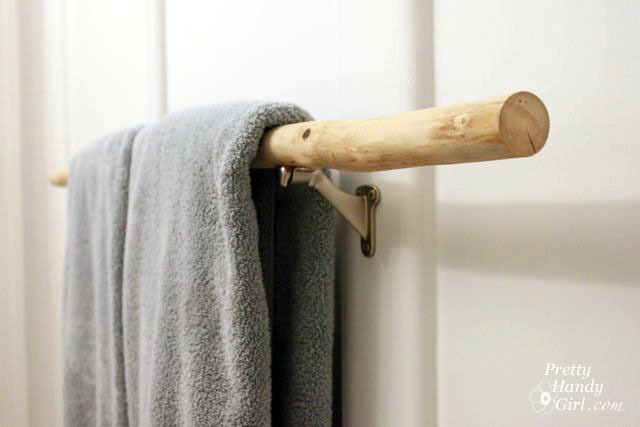 Create a towel bar using a branch. Great for that added rustic touch! 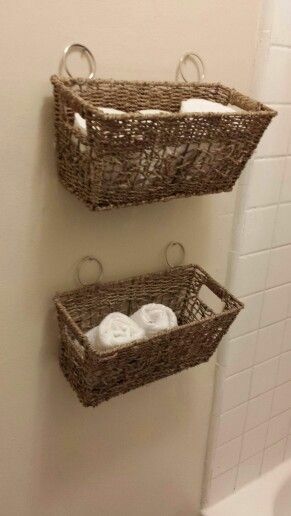 Woven baskets replacing the traditional shelf or towel bar. Love the idea! 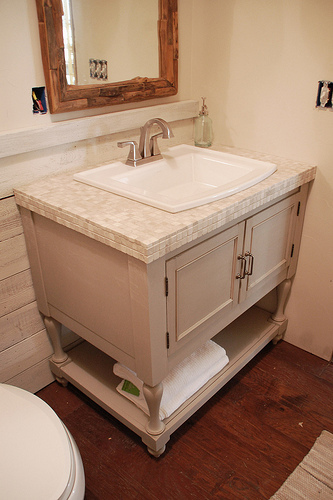 Build your very own “knock-off” Pottery Barn vanity for a fraction of the price. DIY Divas gives you step by step instructions. 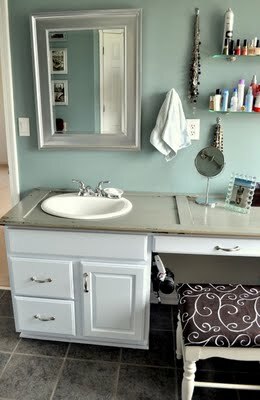 An old shutter turned into a vanity counter top. New uses for old things! What’s your favourite? Have you seen other unique bathroom finds? I’m loving this roundup. It’s sometimes overwhelming seeing everything on pinterest, but SO NICE to see a bunch of ideas grouped together. I just finished decorating my bathroom but still have another one to tackle, I’m thinking I’ll probably make the countertop display!